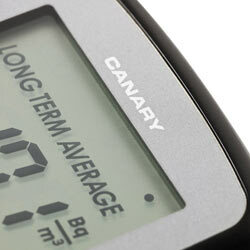 By means of the radon-monitor Canary the concentration of radon can be recorded over a longer time period. Thus the radon-monitor Canary calculates and records even the average ratio per day or even per week and, in addition to that even the cumulative value for a whole year. 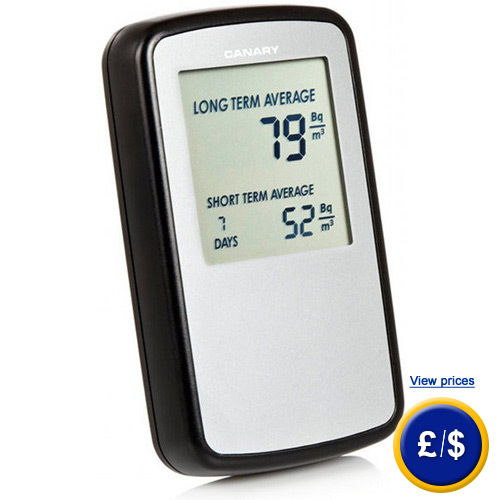 The battery- driven radon-monitor Canary can be installed at any corner of the apartment, house or factory and measure the radon-ratio of the air due to its simple and compact design. Common technologies are in contrast to the radon-monitor much more complex and time-consuming. But with the help of the radon-monitor Canary the accession of radon into a building can be detected and located much more effectively. Due to the fact that the radon-monitor measures the concentration of radon during a certain amount of time in various rooms. The radon-monitor enables its operator to locate where the radon comes from and to initiate, if necessary, certain steps to inhibit its source even before it might become necessary to request the help of professionals for that. To operate the radon-monitor it is not even required necessarily to have any knowledge on the principle of measurement for that device. After installing the rad-monitor the measurement is performed fully automated. Further information on standard values as well as general information concerning radon is mentioned below as well as on the topic page "radon meters". Despite the fact that the radon-monitor will be delivered with a bore hole on its backside, it is discouraged to install the radon-monitor onto a wall since it might lead to falsified results. Instead it is advised to deposit the radon-monitor with its display upturned, which is suggested by most of the national authorities for radiation protection. Furthermore such a radon-monitor should be used in rooms that are connected to the underground. Therefore it should be paid attention to positioning the device at least 25 cm away from walls, at least 50 cm above the ground and at least 150 cm away from the next aeration facility. The operator can start the measurement immediately after inserting the batteries. After approximately five minutes in the upper right corner a measurement indicator will then start blinking, which indicates that the radon-monitor is processing the measurement. If during the measuring process the display indicates "ERR ###", the batteries need to be replaced. The symbol "9999 Bq/m³" signals that the radon-monitor has reached its maximum displayed value, which means that the measuring value of approximately 10,000 Bq/m³ has been reached. It also indicates a significantly raised radon concentration that might severely effect the health if precautious steps are not immediately taken. In case that you should have more questions regarding the radon-monitor Canary, please read the following technical data, use our contact form or call us: UK customers +44(0) 23 809 870 30 / US customers +1-410-387-7703. Our technicians and engineers will gladly advise you regarding the radioactivity meters or all other products in the field of Control Systems, Laboratory Equipment, Measuring Instruments or Scales and Balances of PCE Instruments Ltd. Display with indicator (dot at the upper right corner) of Radon-Monitor Canary.